“The Fantasticks” seems to be just the sort of musical that I’ve always intended to fall in love with … it’s just that no one has ever given me a reason to do so. All that has changed with the Omaha Community Playhouse production of the poetic parable about young love confronted by the hard knocks of life. Here a top-notch cast and crew fuel a cleverly staged and costumed performance that offers a couple of big surprises. The first is the choice to dress the proceedings in the trappings of steampunk. 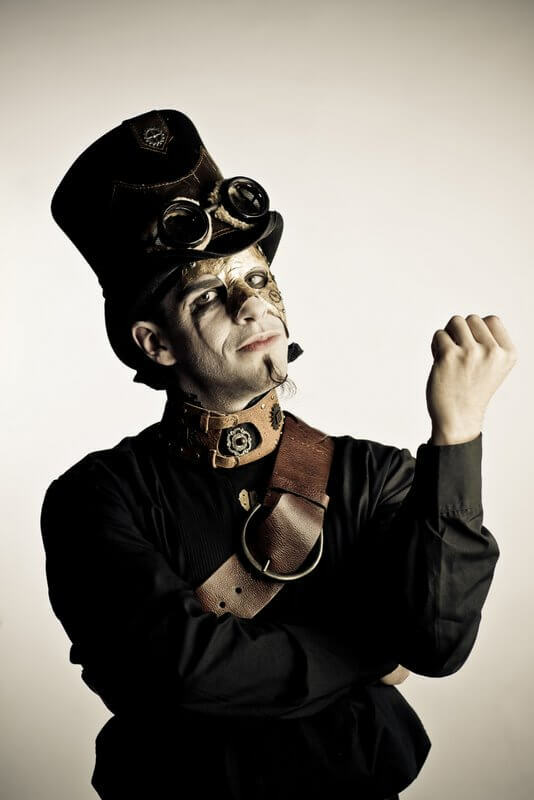 Georgiann Regan’s upside-down mash-up of “retro-future” leather, goggles, top hats, Borg-like prosthetic appendages and deconstructed clockwork machinations evoke Victorian sensibilities clashing with an out-of-time, decades-hopping technological palette, the hallmark of steampunk aesthetics. The other surprise involves one of the more dramatic entrances in recent Playhouse memory (or any other theater, for that matter) when the first act races to its climactic conclusion with the jarring appearance of a behemoth … no, no, not so fast … it wouldn’t be fair to spoil the fun. You’ll have to see for yourself the animatronic bucket of bolts that has leapt from the boundless imaginations and technical prowess of property designers Amy Reiner and Lynn Ridge. What isn’t a surprise is a cast that delivers, from top to bottom, an octet of amazing performances. The incomparable Seth Fox (Billy Flynn from the company’s recent blockbuster production of “Chicago”) hits it out of the park in opening the evening with the work’s signature song, “Try to Remember.” He plays both the narrator and El Gallo, the trickster brought in by the fathers to stage an abduction. El Gallo is aided by his fumbling sidekicks; the senescent Henry, played with whimsical flair by audience favorite Bernie Clark, and the dim-dimmer-dimmest Mortimer, as portrayed by Matt Kelehan in yet another of his trademark “small is big” smallish roles. The steampunk vibe may at first seem a bit of an incongruent puzzler, but it turns out to not only blend seamlessly with the off-kilter themes of The Fantasticks, but also adds some eye-popping oomph to a musical already known for its slightly surreal foray into a fanciful, almost mythical world. At the center of it all is a prop that takes on the role of a ninth character, a rustic trunk from which emerges most of the show’s most memorable props — including a box of moonlight that serves to illuminate the hopes and dreams of anyone who has ever fallen under the spell of Cupid’s arrow. Just in time for Valentines Day, director Carl Beck’s The Fantasticks has this reviewer tempted to buy an extra box of chocolates for the musical that has at long last captured my heart. The Fantasticks runs through March 18 at the Omaha Community Playhouse, 6915 Cass St. Performances are Thursday–Saturday at 7:30 p.m., Sunday at 2 p.m. and tickets are $40 for adults, $24 for students. Visit omahaplayhouse.com or call the box office at 402-553-4890 for additional information.